McCormick Baking Coupon—Vanilla $1.25 at Walgreens! 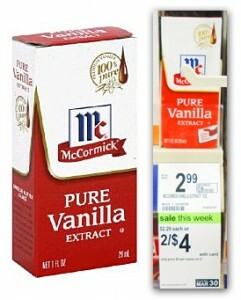 Head to Walgreens to save on McCormick Pure Vanilla Extract. Use two coupons from the 3/3 Red Plum newspaper insert to pay only $1.25 each!